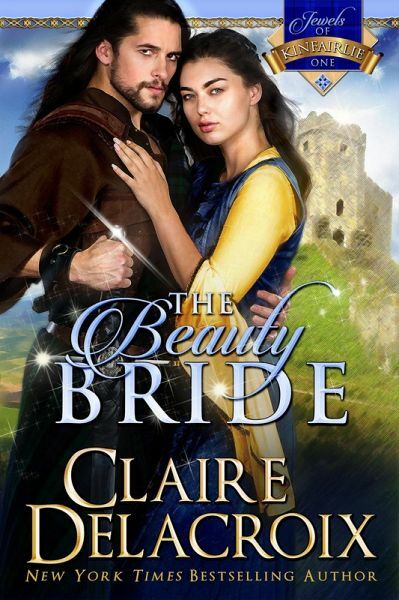 More cherished than gold are the Jewels of Kinfairlie, and only the worthiest may fight for their love...The Laird of Kinfairlie has unmarried sisters, each a gem in her own right. And he has no choice but to see them all wed in haste. Lady Madeline's heart is not for sale...especially not to a notorious outlaw like Rhys FitzHenry. Yet Madeline's hand has been sold, to none other than this battle-weary warrior with a price on his head. A more dutiful maiden might cede to the Laird's command and meekly accept her fate, but Madeline has never been obedient. She decides to run away, though she never dreams that Rhys will pursue her. She does not expect this taciturn man to woo her with fanciful stories, much less that each of his enthralling tales will reveal a scar upon his shielded soul. She never imagines that a man like Rhys could imperil her own heart while revealing so little of his own feelings. When Rhys' past threatens his future, Madeline takes a leap of faith. She dares to believe him innocent — and risks her own life to pursue a passion more priceless than the rarest gem. Bestselling and award-winning author Deborah Cooke has published over seventy novels and novellas, including historical romances, fantasy romances, fantasy novels with romantic elements, paranormal romances, contemporary romances, urban fantasy romances, time travel romances and paranormal young adult novels. She writes as herself, Deborah Cooke, as Claire Delacroix, and has written as Claire Cross. She is nationally bestselling, as well as a USA Today and New York Times' Bestselling Author. Her Claire Delacroix medieval romance, The Beauty, was her first book to land on the New York Times List of Bestselling Books. Deborah was the writer-in-residence at the Toronto Public Library in 2009, the first time TPL hosted a residency focused on the romance genre, and she was honored to receive the Romance Writers of America PRO Mentor of the Year Award in 2012. She lives in Canada with her family.